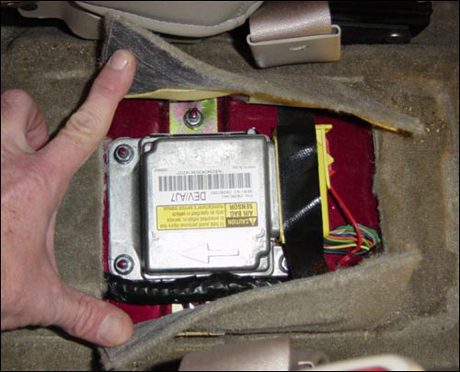 Most cars these days are equipped with an “event data recorder,” or EDR — a device that tracks information like vehicle speed and brake activation, which engineers can use to fine tune safety features. Such data would seem to be very useful to the public. It could help car and road designers make both safer, and it could help to prosecute drivers whose negligence leads to a death or injury of another. And for those reasons, the “National Highway Traffic Safety Administration has proposed making the devices mandatory on all new cars, starting next year.” But Rep. Michael Capuano, D-Mass wants to let drivers opt out of using them. “I would argue that this is a device that the average person should be able to turn off if they so desire,” he says. I have to disagree, because while the EFF and Capuano have some valid concerns (about who can access the data, what it records and who owns it), those are addressed by current regulations. So, drivers already have the right to “opt out,” just after the crash – unless they’re a suspect in a criminal investigation. If one is worried that this is a privacy violation, consider that – with a warrant – we can make drivers submit to a blood test. You can’t tell me that downloading data off their car’s computer is more invasive. A website called Govtrack predicts that Capuano’s bill probably won’t go anywhere. Nevertheless, Wash Cycle says, going forward it’s important to balance reasonable privacy concerns with the important public aim of reducing traffic injuries and deaths. Elsewhere on the Network today: Bike Portland reports on a recent case where a driver was charged for careless driving. Baltimore Spokes relays the news that Austin, Texas, police are using bike patrols to bust drivers for unsafe passing. And Urban Cincy contemplates the connection between good neighborhood design and personal happiness. Can Algorithms Design Safer Intersections? Cities and tech firms are deploying new technology to gauge risks at dangerous intersections. These sensors, cameras, and machine-learning algorithms are promising, especially when it comes to measuring close calls that don't result in crashes - but cities are still figuring out how they can use this information. In the meantime, there's no reason to wait on designing safe streets.